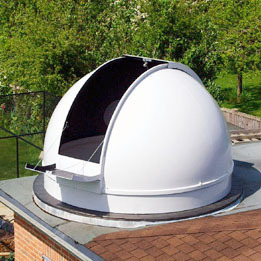 The 2.7 metre observatory dome is constructed of glass fibre, and is available as a full height observatory, or short height observatory for roof installation. Also available as a dome and shutter only kit if you decide to build your own walls. Dimensions for the dome are as per full height 2.7 metre dome.